The central focus of 'The Lord of the Rings' is the One Ring, a piece of jewellery forged by the Dark Lord Sauron and possessing all of his evil power. It is said to be able to corrupt minds and turn men to wickedness. The entirety of Frodo's quest is based around throwing the Ring into Mount Doom in order to destroy Sauron's power forever. But Sauron's power didn't lie in the Ring. It lay in Gollum. The Ring had the power to turn people evil, yes. Gollum had it in his possession for over five hundred years, turning him from the kindly hobbit Sméagol into a horrific mutated creature driven by evil. Aside from Sauron, Gollum is the only creature until that point to have held the Ring for any amount of time, having passed very briefly from hand to hand until it fell into Gollum's clutches. What we must remember though, is thermodynamics and the concentration of energy. Sauron's power is vast, yes, but it is not infinite. Thus there is only a finite amount of evil inside the Ring that can affect people. For five hundred years this evil would have seeped into Gollum via an osmosis-like process, increasing his level of evil, but at the same time decreasing the evil held in the Ring. After five hundred years, it is very possible that barely any evil powers remained in the Ring at all! The Ring had a legendary corrupting power, but Bilbo, who holds it for many years, is barely corrupted at all. Frodo likewise is unaffected by the Ring... until he meets Gollum. At this point Frodo starts to find his mind swayed by evil, where we have already seen that a hobbit holding the Ring for years does nothing. Clearly this corruptive influence was coming from Gollum rather than the Ring. 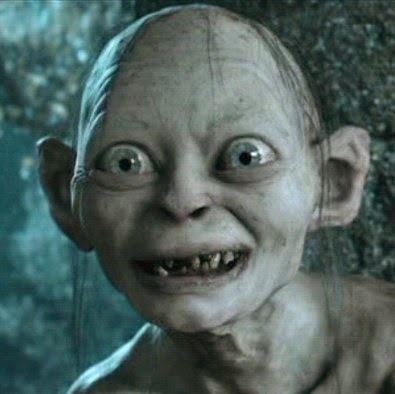 Gollum constantly talks to himself, showing the avatar of the spirit of evil to be infesting him and not the One Ring. Gollum also shows darker powers more in keeping with that of Sauron than a normal hobbit. He is in league with Shealob the spider, an evil creature that even Sauron fears (remember, Shelob wasn't simply a giant spider, she was the spawn of the evil creature Ungoliant). How can something as insignificant as Gollum become a peer to Shelob if not from the power of the Ring that he holds in his very body. Further evidence can be seen in a direct comparison of the effect of the loss of the Ring on the Ring-bearer. At the start of Fellowship of the Ring when Sauron's ring-finger is cut off he explodes in a nuclear fireball. At the end of Return of the King the exact same situation occurs, as Frodo loses the finger on which he wears the Ring. Yet Frodo does not instantly explode in a fireball, showing that the true power of the Ring was not present in the Ring itself. Sauron is only defeated when Gollum is hurled into the fires of Mount Doom, ending his evil power forever. It is a bitter irony that Sauron held Gollum in his hands before the films began, only to let him go again. Like many men, Sauron was fixated only on jewellery, gold and greed, unable to see what was actually there in front of him.